BIG SALE!! SPUN GLASS SUNCATCHERS BIG SALE!! Attractive glass Butterfly Ornament or Suncatcher in true red with clear body and yellow antennae on nylon string hanger. Use as a window or auto hanging ornament or hang on a prism holder. Cheerful glass Butterfly Suncatcher or ornament in sunny yellow with clear body and yellow antennae on nylon string hanger. Use as a window or auto hanging ornament or hang on a prism holder. Appealing glass Butterfly Suncatcher or ornament in crisp dark blue with clear body and yellow antennae on nylon string hanger. Use as a window or auto hanging ornament or hang on a prism holder. Cool glass Butterfly Ornament or Suncatcher in regal purple with clear body and yellow antennae on nylon string hanger. Use as a window or auto hanging ornament or hang on a prism holder. Charming glass Butterfly Suncatcher or ornament in soothing sky blue with clear body and yellow antennae on nylon string hanger. Use as a window or auto hanging ornament or hang on a prism holder. Lovely glass Butterfly Suncatcher or ornament in pink with clear body and yellow antennae on nylon string hanger. Use as a window or auto hanging ornament or hang on a prism holder. Charming sapphire blue and amethyst winged Ballerina Fairy is on point and has a sparkling hand spun glass tutu. 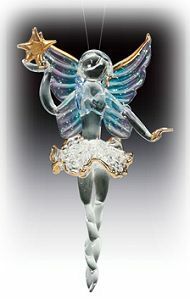 Glass Fairy Suncatcher ornament with nylon string hanger and gold accented hands, wings and skirt is gift boxed. 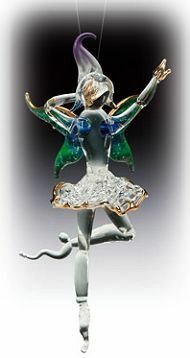 Gorgeous leaping emerald winged Ballerina Fairy in hand spun glass, brings whimsy and delight to any decor. Glass Fairy Suncatcher ornament with nylon string hanger and gold tipped hands, wings and skirt is gift boxed. 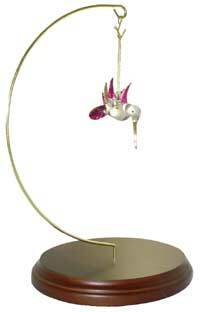 Classic wood ornament stand with oval Fruitwood base and polished brass hanging wire. Show off your treasures in style. Also available with silver tone wire by request. Hummingbird shown is sold separately. 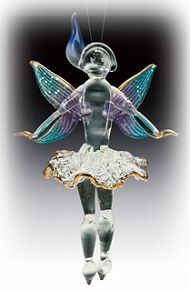 An enchanting Amethyst winged Ballerina Fairy glistens in hand spun glass. She holds up a gold star and has gold accented hands, wings and skirt. Spun glass Fairy Suncatcher ornament with nylon string hanger.